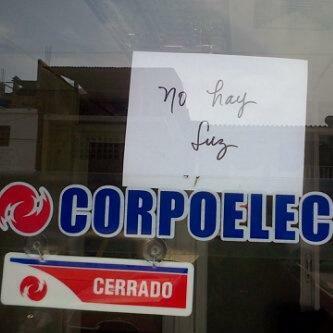 A CORPOELEC office closed down for lack of electric power. Yep, things like this do happen. In a campaign rally in Cojedes today, Acting-(Like-a)-President Nicolás Maduro announced the creation of a brand new mission for the electricity sector, focus to fight what he calls an upcoming “electrical war”. To show strong leadership, he ordered a nationwide military deployment to all electrical stations and sub-stations to respond against an alleged opposition plan to “leave the country in the dark”. The late comandante presidente ordered a similar measure in March 2010. It didn’t do much back then. Electrons are curiously nonplussed by goons with guns. Blackouts around the country have increased in the first months of 2013, in part because of the increasing demand amid frozen nominal prices, leading to constant breakdowns in the national grid. While the head of CORPOELEC, Argenis Chávez, says new projects are underway to reduce the power deficit across the regions, electric consultant Jose Aguilar believes that we’ve yet to hit rock bottom.